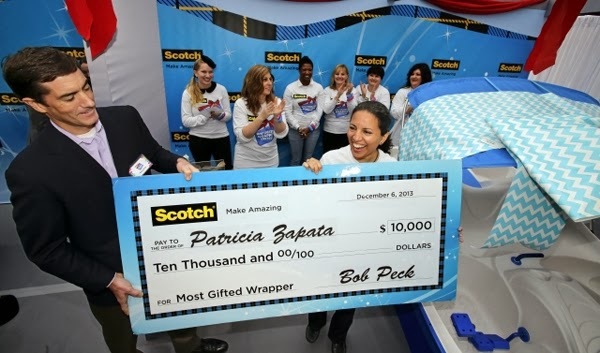 A Little Hut - Patricia Zapata: Scotch Brand Most Gifted Wrapper Contest — I won! Scotch Brand Most Gifted Wrapper Contest — I won! I've been back from NYC for four days and I'm still going over the whole trip in my head over and over again. 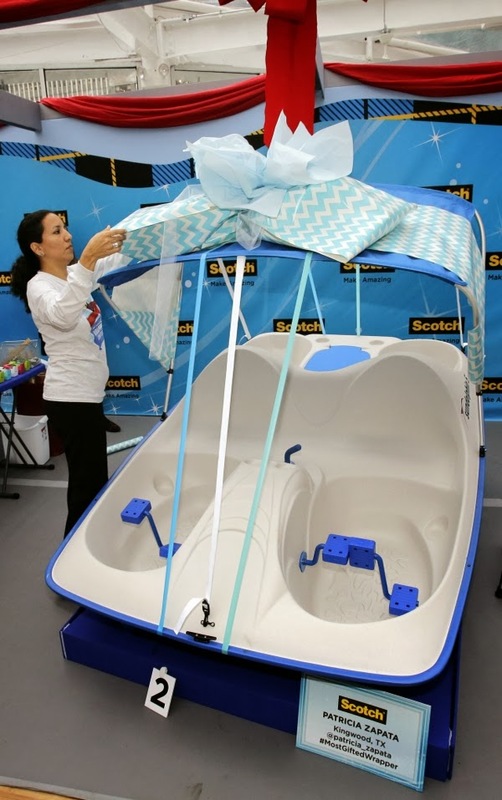 I participated in Scotch Brand Most Gifted Wrapper Contest and simply put it was a whirlwind experience! It was intense, exhausting but very worth it. First of all I could write a whole entire post about my attempts at making it to NYC. After three airplanes and 8 hours in the Houston airport I finally made it to the city. Craziness! The plus side—I met THEEE nicest people that day. As bad as the situation was, it was amazing that almost everyone there was really making the best of it and just being patient with the whole ordeal. I mean, seriously, what else could we have done? I finally make it to NYC, 2 hrs late for a meeting where all the finalists met (a really friendly bunch—all of them! ), went over the rules, materials and prep work for the next day. I was so tired that night that I couldn't fall asleep until 1:30am. I was also STILL struggling with what my plan was going to be for the go-kart, if I made it to that round. Yes, we did know what we where going to wrap ahead of time—thank goodness! And yes, even after weeks of thinking about it, I still didn't have a plan for that one. It was killing me! You're going to laugh but I had to dig through my own work—thank you Google images—to get inspired. As soon as I thought about making a big flower (this one) and planned how I was going to make it ten times bigger and with tape, I felt I could rest and the Zzzz's took over. We met at the hotel lobby at 6am and the contest started over a couple of hours later. It was a cold and rainy day but that didn't damper anyone's spirits. After round one (we had to wrap a box and a castle) I was 100% certain that I was going to be eliminated. The box—what you'd think would be the easiest thing to tackle—was a total disaster. Awful!! I amazingly didn't get eliminated and made it to the second (go-kart) and final (paddle boat) rounds. As soon as I was declared the winner (was I surprised? of course!!!!) all hell broke loose. I don't think I've ever had that many pictures taken in such a short amount of time, or given that many interviews either (in Spanish and English mind you). Very crazy! I couldn't even call my Mr. Z to tell him about my win until waaaay later. Later that afternoon I recorded two segments one of which aired today and another that is soon to come. You can see me with Martin Amado (one of the judges, expert decorator and a great guy all around!) in the Best Holiday Gift-Wrapping Tips video here. Martin's on camera experience really shows and I learned so much from him. Thank you Martin! 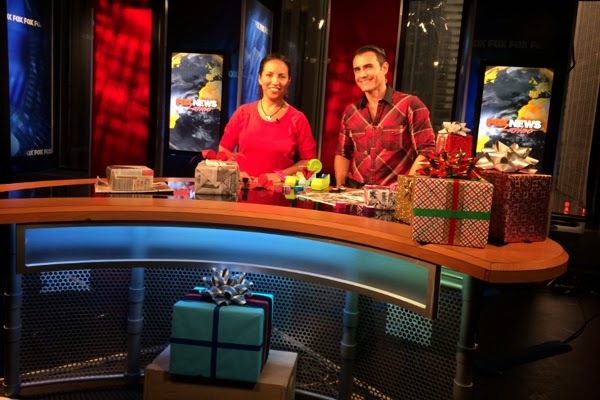 That night Martin and I had to do prep work for the Fox and Friends live segment we did the following day. 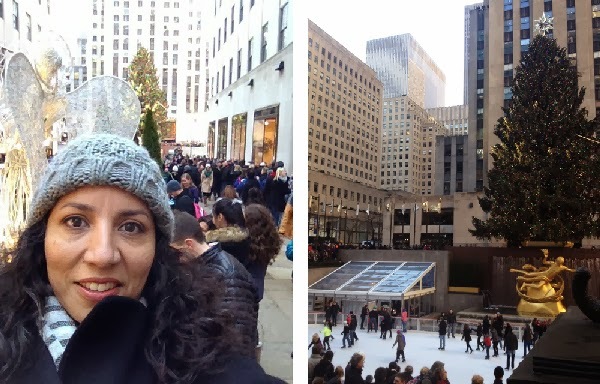 And even though I thought I'd drop dead we headed to Rockefeller Center to see the tree. Why not? Got up early, headed to Fox News, got some make up done and before I knew it I was on live national TV - 'Fox & Friends' gift wrap off - Here's the proof! The rest of the day I walked around midtown, did some shopping along 5th avenue and enjoyed all the Christmas windows and scenery. The streets were crowded and it was bitter cold but it was just perfect for what you'd expect for this time of the year in NYC (unless you live there and avoid all touristy areas at all costs! haha!). I flew home and slept ALL day—and that was that! Like I said—a whirlwind experience! Thank you to Scotch Products and Hunter PR (so great to meet you ladies!!) for putting on such a fun and well organized event. 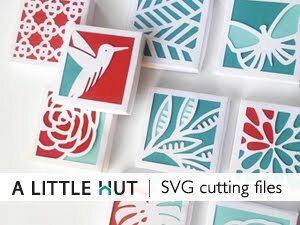 If you love paper and you feel like you have what it takes to compete I highly encourage you to participate next year. You won't regret it—take the shot—you just never know!